JSC Ukrgasvydobuvannya in order to increase own gas production within the framework of program "20/20” is considering ways to expand the new resource base, the development of which depends on the implementation of a production plan amounting to about 5 bln m3 of blue fuel by the end of 2020. To date, there are two ways to expand the new resource base for oil and gas companies: the procedure for obtaining special permits beyond the auctions in the framework of Resolution No. 615 of the Cabinet of Ministers of Ukraine and the procedure for obtaining special permits via the auctions in the framework of Resolution No. 594 of the Cabinet of Ministers of Ukraine. But according to the recent changes to the effective Orders made by the Government, in the near future, it will be possible to obtain the special permits for new sites only through participation in open auctions. 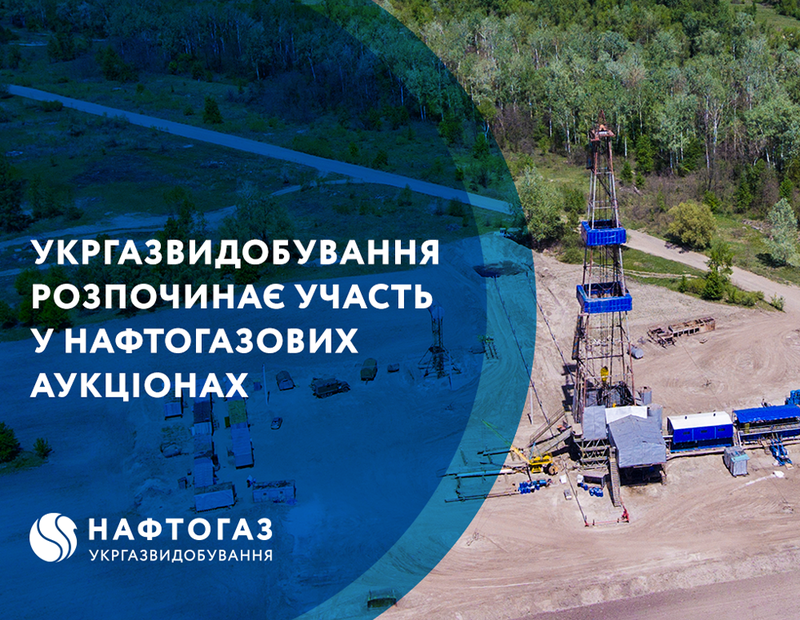 Ukrgasvydobuvannya supports the decision of the Government and the activities of the State Service of Geology and Subsoil of Ukraine in the direction of conducting transparent oil and gas auctions and is ready to cooperate. Based on the above, the decision of UGV to participate in II 2018 auction on the sale of special permits for use of subsoil held by the State Service of Geology and Subsoil of Ukraine was adopted. The hydrocarbon site, being of interest to the Company, is put on the auction. UGV plans to further participate in auctions and electronic bidding, held by the State Service of Geology and Subsoil of Ukraine, for the new sites. Currently, the Company selects the economically profitable areas among the announced auctions in the framework of the implementation of "20/20" program on increasing the production of own gas. The State Service of Geology and Subsoil of Ukraine, as an auction organizer, announced the launch of three auctions in 2018 for selling the special permits for the use of subsoil. In course of the first auction, held on August 9, 2018, the plots of subsoil non-metallic minerals and groundwater were put on sale. For the second auction to be held on October, 25, 2018, 4 hydrocarbon subsoil areas are put on sale. Among them are, in particular, Lypovets deposit, Chernytsia deposit, Yavoriv deposit, located in Lviv region, and Surmachivka deposit, located in Sumy region. For the third auction to be held on December 27, 2018, only the plots of subsoil non-metallic minerals and groundwater were put on sale. Also, preparations for the 2019 auctions and the first electronic tenders for the sale of oil and gas subsoil sites are ongoing. +38 044 272-24-41, 0 800 50 01 45 trust line "Anticorruption"